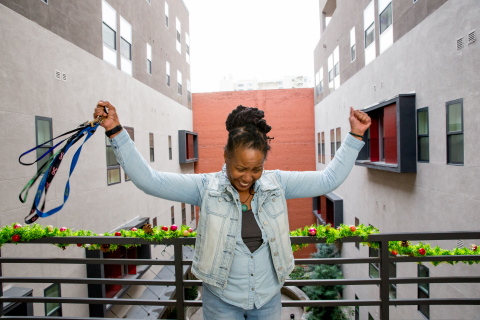 June holds up keys to her home at New Pershing apartments in downtown Los Angeles. Photo by Michael Brannigan. LOS ANGELES--(BUSINESS WIRE)--Understanding that stable homes provide an important platform for individual success and thriving communities, nine of the nation’s largest private foundations have joined forces to create the Funders for Housing and Opportunity collaborative with the goal of ensuring individuals and families across America who spend more than half of their income on rent -- or have no homes at all -- will be able to afford safe, stable rentals in thriving communities. Together, Funders for Housing and Opportunity will commit grant dollars that will be used to catalyze systemic change; $4.9 million has already been committed to four grantees over the next three years. Members of the new collaborative include: The Annie E. Casey Foundation, Bill & Melinda Gates Foundation, Conrad N. Hilton Foundation, Ford Foundation, John D. and Catherine T. MacArthur Foundation, The JPB Foundation, The Kresge Foundation, Melville Charitable Trust, and Oak Foundation. There is a strong connection between safe, affordable housing and better life outcomes. But for too many Americans, that is just a distant dream. In no state can a person earning the minimum wage and working 40 hours per week afford to rent a basic two-bedroom apartment, even in states where the minimum wage is set above the federal level (National Low Income Housing Coalition). The burden is not confined to high-cost cities: every county in the United States has a shortage of available and affordable rental units for its extremely low-income residents (Urban Institute). Separately, members of the collaborative invested more than $65 million in domestic housing-related activities in 2017. The new collaborative allows these foundations to align strategies, leverage their funds, and extend their reach beyond what they could individually support. Drawing on their diverse expertise and collective resources, members of Funders for Housing and Opportunity seek to make stable housing a reality for every American household. The issue cannot be addressed in isolation, and the group is calling upon nonprofit, public and private partners across a range of areas such as education, health and employment to play a role in promoting long term change that delivers results. The collaborative has awarded an initial $4.9 million to four nonprofit organizations on the front lines of addressing housing insecurity and its impacts. Subsequent grants will be issued through invitation or formal RFP processes over the next three years. Center for Community Change’s Housing Trust Fund Project will build the power and capacity of state and local partners and resident leaders to increase state and local revenue for affordable housing, scale and expand resident leadership, and strengthen a national housing movement for policies that address the unmet housing needs of people at the lowest incomes. National, with focus on resident engagement in California and Washington; $750,000 award over three years. National Housing Trust and Enterprise Community Partners will lead a community development coalition that raises the voices of residents regarding housing concerns and connects them to elected representatives and to health, education and energy campaigns in their communities. Florida, Iowa, Maine, Michigan, Ohio, Pennsylvania, South Carolina, Virginia, West Virginia and Wisconsin; $1,050,000 award over three years. The National Low Income Housing Coalition will lead a campaign, together with the Center on Budget and Policy Priorities, Children’s Health Watch, Make Room, and the National Alliance to End Homelessness, that advances affordable housing solutions for the lowest income people, galvanizing housers, educators, health professionals, civil rights and anti-poverty advocates, the faith-based community, and others. National; $2,700,000 award over three years. Partnership for Children & Youth will provide training, coaching and capacity-building work to housing developments, with the aim of increasing the expanded learning program quality through gains in student health and wellness, academic achievement and family economic and housing stability. California and Washington; $400,000 award over two years. In addition to grantmaking, Funders for Housing and Opportunity will work with a cross-section of partners that share an understanding that stable housing is essential to success across a multitude of dimensions, such as health, education, and economic mobility. The Annie E. Casey Foundation is a private philanthropy that creates a brighter future for the nation’s children by developing solutions to strengthen families, build paths to economic opportunity and transform struggling communities into safer and healthier places to live, work and grow. For more information, visit the Foundation’s website at www.aecf.org. The Bill & Melinda Gates Foundation works to help all people lead healthy, productive lives. In developing countries, it focuses on improving people’s health and fighting hunger and poverty. In the United States, it seeks to significantly improve education so that all young people have the opportunity to reach their full potential. For more information, please visit www.gatesfoundation.org. The Conrad N. Hilton Foundation was created in 1944 by international business pioneer Conrad N. Hilton, who founded Hilton Hotels and left his fortune to help the world’s disadvantaged and vulnerable people. From its inception, the Foundation has awarded more than $1.6 billion in grants, distributing $114.9 million in the U.S. and around the world in 2016. The Foundation’s current assets are approximately $2.8 billion. For more information, please visit www.hiltonfoundation.org. The Ford Foundation is an independent, nonprofit grant-making organization. For more than 80 years it has worked with courageous people on the frontlines of social change worldwide, guided by its mission to strengthen democratic values, reduce poverty and injustice, promote international cooperation, and advance human achievement. With headquarters in New York, the foundation has offices in Latin America, Africa, the Middle East, and Asia. More information can be found at www.fordfoundation.org. The John D. and Catherine T. MacArthur Foundation supports creative people, effective institutions, and influential networks building a more just, verdant, and peaceful world. MacArthur is placing a few big bets that truly significant progress is possible on some of the world’s most pressing social challenges, including over-incarceration, global climate change, nuclear risk, and significantly increasing financial capital for the social sector. In addition to the MacArthur Fellows Program, the Foundation continues its historic commitments to the role of journalism in a responsible and responsive democracy, as well as the strength and vitality of our headquarters city, Chicago. More information is available at macfound.org. The JPB Foundation advances opportunity in the United States through transformational initiatives that empower those living in poverty, enrich and sustain our environment, and enable pioneering medical research. For more information, please visit www.jpbfoundation.org. The Kresge Foundation is a $3.6 billion private, national foundation that works to expand opportunities in America's cities through grantmaking and social investing in arts and culture, education, environment, health, human services and community development in Detroit. For more information, visit the Foundation’s website at www.kresge.org. The Melville Charitable Trust is the largest foundation in the U.S. exclusively devoted to ending homelessness. We invest in proven, lasting, and cost-effective solutions that enable people who have experienced homelessness to reclaim their lives. For more information, please visit www.melvilletrust.org. The Oak Foundation commits its resources to address issues of global, social and environmental concern, particularly those that have a major impact on the lives of the disadvantaged. With offices in Europe, Africa, India and North America, we make grants to organizations in approximately 40 countries worldwide. More information can be found at www.oakfnd.org.